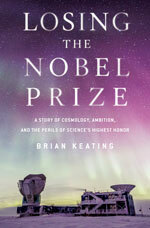 Keating authored a popular science book entitled Losing the Nobel Prize: A Story of Cosmology, Ambition, and the Perils of Science’s Highest Honor about the BICEP2 affair and the concomitant problems with the Nobel Prize in physics. It is one of Amazon’s ten best non-fiction books of the month and Nature magazine’s six best of the season. At Professor Keating’s website, https://briankeating.com/ you can see his many videos, podcasts, and insights into his research.